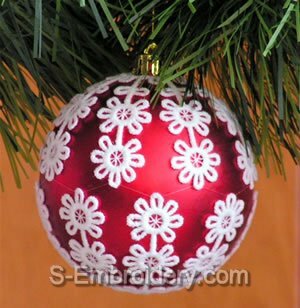 A fine set of 5 free standing lace Christmas ornament covers. 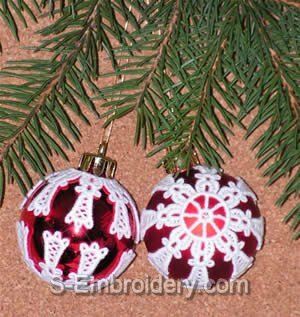 Each design is delivered in 2 variants that will let you create 2 different looking ornament covers. 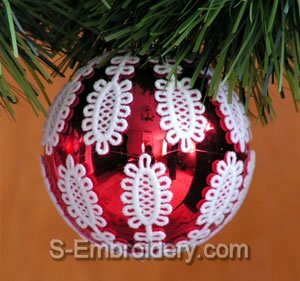 When ordering you have a choice of 6 sizes, so that the covers will fit better to your Christmas ornaments: 50 mm (2 inches); 60 mm; 65 mm (2.5 inches); 70 mm; 75 mm (3 inches); 80 mm. 1. 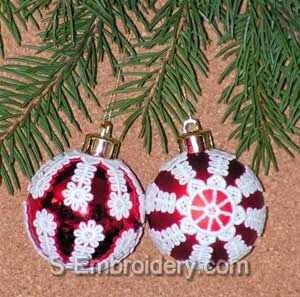 The above sizes are the diameter of the Christmas ornaments, NOT the size of FSL designs. 2. It often happens that the real size of Christmas ornaments may differ from the one, announced on package.Thanks to the design, you should be able to use our FSL covers even with ornaments with a size that differs +/- 5 mm (2/8 in) from the one they were designed for. 3. 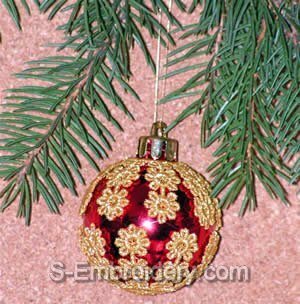 The first 2 sizes (for 50 and 60 mm ornaments) will fit in 4x4 hoops. 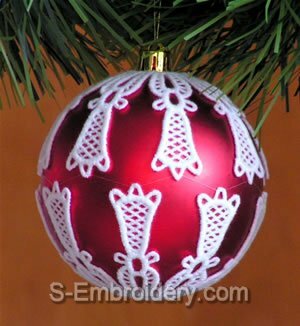 To stitch out covers for 60, 65, 70,75 and 80 mm ornaments you will need a hoop, that is bigger than 4x4. 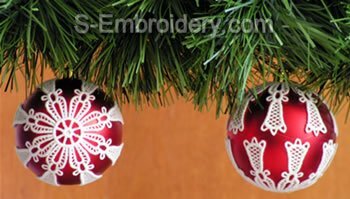 The set we deliver includes design information in PDF format, as well as 10 machine embroidery files with your preferred size and embroidery format.